Seasoning your pans can be a convenient solution to stop food from sticking to your cookware. Most foods, when cooked properly, typically don't stick to stainless steel pans, but eggs and egg dishes tend to stick more easily. A seasoned pan will help prevent sticking. Whether you prefer stainless steel over nonstick-coated cookware, or simply want to make your pans a little more versatile, we'll show you how to effectively season your cookware in 5 easy steps. Start by giving your pan a thorough washing, especially if you’re breaking in your stainless steel pan. Use a mild dish detergent and warm water to gently scrub the interior and exterior of the pan. Rinse and dry thoroughly. Coat the interior of the pan with a layer of oil. Look for oil with a high smoke point like peanut oil. Use your fingers to coat the entire interior of the pan, including the inner rim. The pan can either be seasoned on the stove or in the oven. If using the stove, place the pan over medium heat. Let it sit until the oil begins to smoke then remove it from the heat. If using an oven, place the oiled pan in a 350-degree oven for one hour. Once the pan has been removed from the heat, let it cool until it can be handled. Using a paper towel, wipe out all the excess oil. Before storing the pan, place a layer of paper towel between each stacked pan to avoid excessive scratching. To maintain the seasoning on your pan, avoid washing it with soap. Instead, wipe the pan clean with paper towels after each use. If food still sticks, scrub the pan with oil and salt then wipe clean with paper towel. If you have to wash the pan with soap, use the steps above to re-season it before next use. Looking to replace your stainless steel pans? 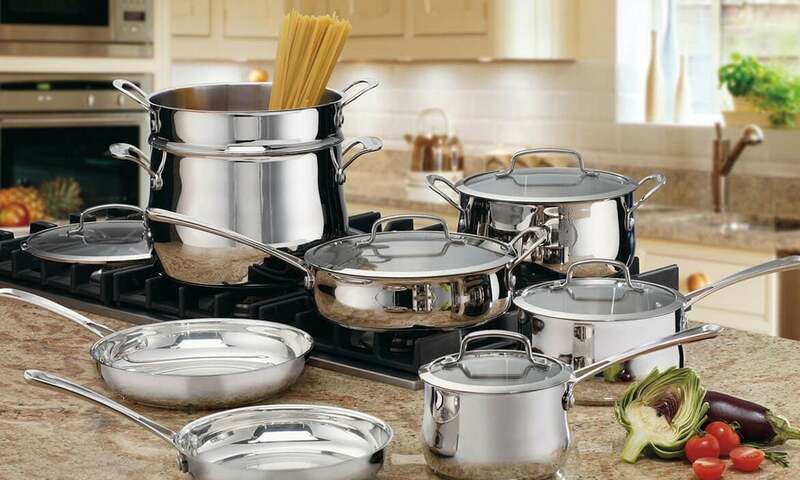 Read our Tips on Buying Stainless Cookware Sets. Add to your collection of cookware by browsing the pros, cons, and care of different cooking materials in our Cookware Buying Guide.